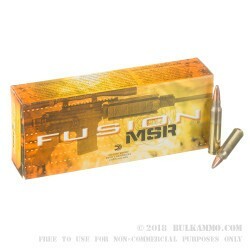 Federal's MSR (modern sporting rifle) cartridges run off a blend of powder and specific selection hard primers that are ideal for flawless function in semi-automatic rifles; harder primers are safer for use with free-floating firing pins such as those found in AR-15 type rifles. 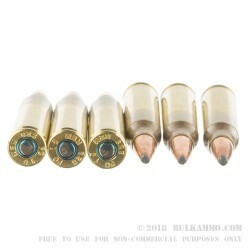 Each of these .223 rounds has its primer inserted into a brass casing with a small compliment of sealant that works to keep ambient moisture from ruining the cartridge. The casing is also heat-treated at the neck and shoulder for proper chamber expansion when fired along with strength that will last through a few reloadings with no issues. A 62-grain Fusion soft point bullet is crimped in at the top of the round where its toothed cannelure keeps it in place for optimal accuracy. 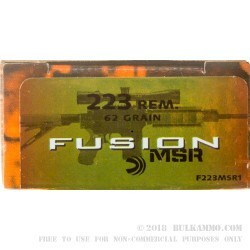 62 grains is a common weight for 5.56mm and .223 Remington and follows common ballistic tables as well as scope reticles. 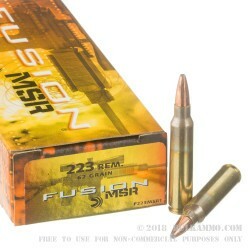 The bullet's exposed lead tip makes for instantaneous expansion during entry into a target while the Fusion projectile's bonded jacket prevents separation, allowing the bullet to achieve deep penetration while carving out a faster-bleeding wound cavity and delivering game-dropping energy to the heart and lungs that rest behind dense bone and muscle. 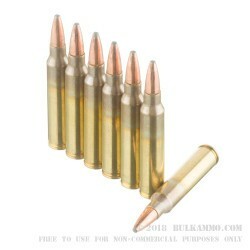 That makes these rounds perfect for medium-sized game like deer, coyote, and some smaller feral hogs.